All experts are experts for things that did happen. There are no experts for things that may happen. Taking this approach is generally a recipe for innovation mediocrity. Experts are absolutely critical in knowledge acquisition; they can be detrimental to concept creation. An expert, by definition, has deep, specific and important knowledge that naturally has direct influence on a company’s ability to come up with new concepts. The issue for an innovator is not whether to tap into the knowledge of a specific expert, but how to use the knowledge of many experts. In reality, how experts can contribute to — and also hinder — the innovation process is a complex question. For different phases and types of innovation, you need to use the right types of experts at the right times and in the right ways. The key to figuring this out lies in the nature of how knowledge is distributed and structured and in the type of innovation you are seeking. A common metaphor for the structure of human knowledge is a branching tree as shown in Figure 1. As knowledge becomes more specialized and detailed, the branches of the tree become refined and focused sets of knowledge categories, each of which will have its own collection of experts who specialize in that area. An expert’s knowledge can be viewed as extending from the base of the tree, through higher and more specialized branches out to a specific twig and leaf at the top of the tree. It is deep and hierarchical. A valuable resource that is focused and narrow. The expert understands the details of how something works, the underlying mechanisms and why they work the way they do. The innovator, on the other hand, needs access to numerous branches, twigs and leaves at many, dispersed places on the tree. Experts themselves should not be relied upon to create the unique concepts that emerge from their own knowledge. 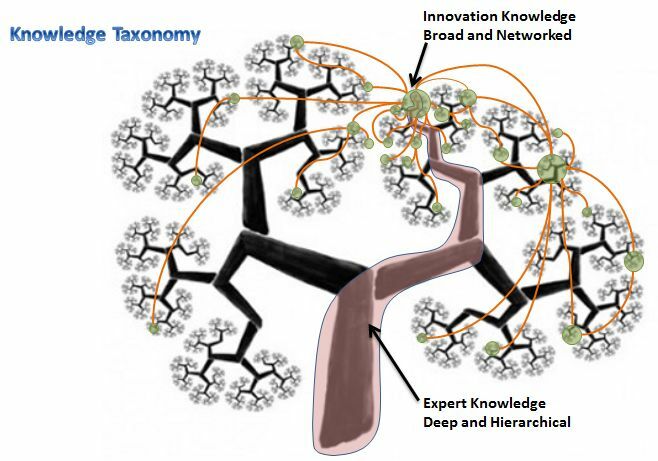 It is incumbent on the innovator to understand multiple, alternative and competing effects that only can be discovered by connecting with and understanding widely separated twigs and leaves on different branches of the knowledge tree. When exploring new strategic opportunities, the innovator does not need to be expert in all of the areas they touch. Instead, the innovator needs to understand the implications of each twig and leaf – the what, not the how – these are the effects of the underlying mechanisms. It is the effects that matter to adopters of products and services, not the means of achieving them. Experts have an important role in innovation efforts, just not the one you may think. The very nature of expertise typically limits the breadth of perspective an expert can contribute. It is the breadth of perspective that is critical in the early stages of strategic innovation efforts. The key for the innovator is not to ‘hire’ a specific expert early on, but to tap into the knowledge of a wide variety of experts – a community of knowledge. There are different types of experts; know which type you are looking for and are dealing with. Science and technology experts – those with a deep understanding of the underlying science and mechanisms by which the material and informational world works. Experts on atoms and bits. Engineering and design experts – those with a deep understanding of the solutions and offerings that exist. The functions and specifications and use of these solutions and how they work. System and industry experts – those with a deep understanding of the system dynamics — the players, how they interact with each other, the current rules of interaction (i.e. the business models). Adopter experts – those who are knowledgeable about the demand side of the innovation equation. These can include not just experts who study markets and trends, but expert consumers and customers themselves. Use experts to inform your knowledge of the way the world works today and in the immediate future, not to predict or anticipate the way the world should or will work tomorrow. Don’t rely on one expert, use many; form a diverse, purpose-built network of experts for acquiring knowledge. Realize that experts also have opinions and beliefs, not just facts and knowledge. Be able to distinguish between the two sides and don’t be surprised when experts differ. Put your wallet away – the knowledge you need is freely shared. The most insightful experts are those that want to enlighten and will freely share their expertise. Experts and expertise are critical to the innovation process, but only when used correctly. An innovator must build a diverse community of experts who have knowledge of the ecosystem dynamics, the market, the technologies, the players, and the rules of engagement. When an innovator uses this community of experts wisely, strategic innovation initiatives become more possible and likely. [i] This post is excerpted from a more in-depth examination of the subject that can be found here.